Explanation: Falling through planet Earth's predawn skies toward its close encounter with the Sun on November 28, Comet ISON is coming to life. 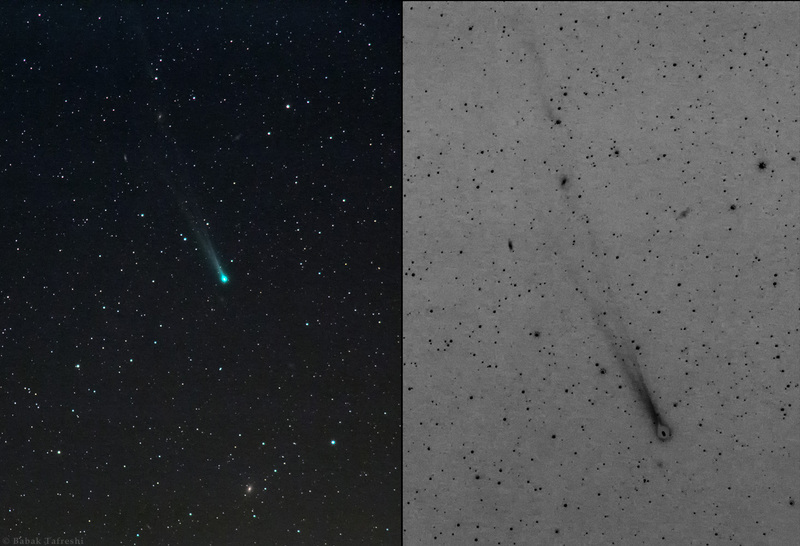 The much anticipated comet has now been reported to have substantially increased in activity, surging to naked-eye visibility for dark sites and sprouting a more complex tail. ISON's tail stretches over two degrees in this telephoto skyview from southern Kenya, captured on the morning of November 14. Shown in two panels, the enlarged negative version on the right makes details of the long tail easier to trace, including the tail's separated filaments toward the top of the frame. A sungrazer and first time visitor to the inner solar system, the possibility of ISON's survival to become a bright comet in planet Earth's December skies remains a question.